Fall is the perfect time to hike and enjoy the bright foliage, that is, when it’s not rainy, super cloudy, or bitterly cold. If you’re introspective, hiking during the changing season is a great time to think about living and dying (which is sort of the same thing), but If you feel yourself thinking too much about death and getting extremely cold, I suggest you go back home, or build a fire, or eat some fat, or if you’re too lazy– just go to “sleep.” Luckily, I caught a fair-weather weekend recently in McCall, and was impressed (as always) by the gorgeous Autumn colors. Warning: the few images in here do not justify the intensity or variety of hues that I saw. Trailhead directions: 18.2 miles North on the Mountain-Goose Lake Road (last 15 miles is gravel). Large parking area on the right. Trailhead (named “Grassy Mountain trailhead” is across the street from the parking lot. Hike the Grassy Mountain Trailhead 0.2 miles, and continue straight following signs for Lake Serene. 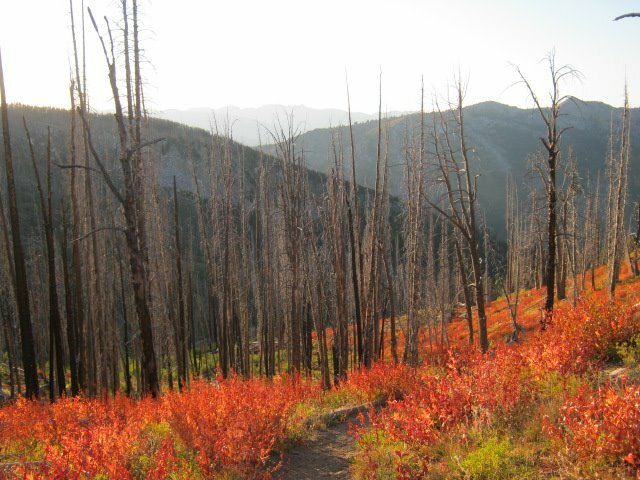 This trail goes through areas affected by fire, which I actually prefer in the Autumn. 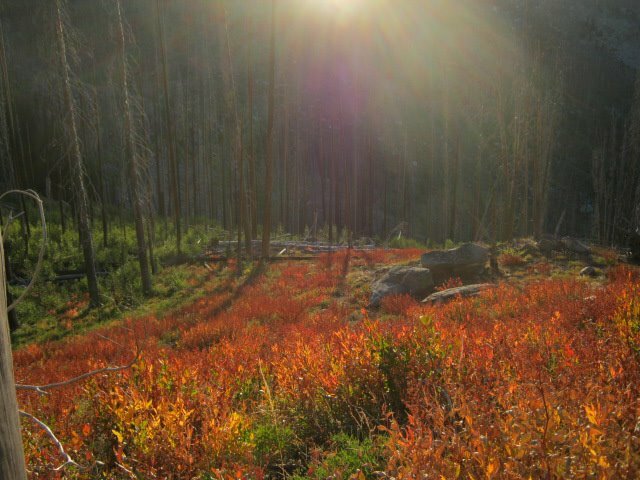 There is lots of sunshine to keep me warm, and the diversity of shrubs, grasses, and wildflowers that are usually present in a post-burn area are changing their hues (or dying, if you prefer) for the season. The views are mostly unhindered by those big annoying green pokey things. 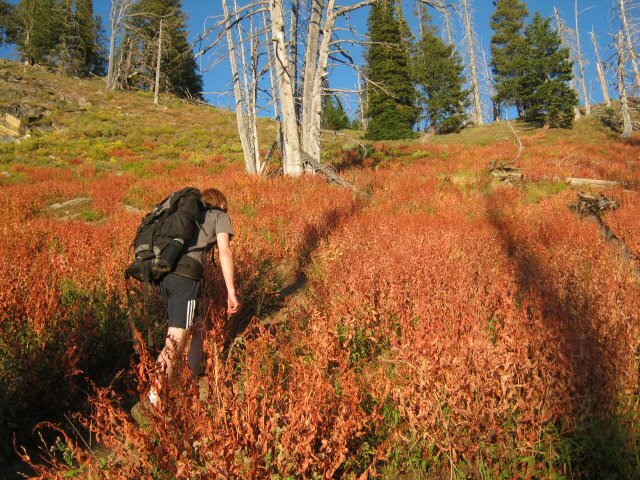 This hike offers sweeping views of bright orange, yellow, and red hillsides with blue mountain ranges in the distance. Serene Lake is not easily accessed. In fact, it’s sort of annoying. You’d think after hiking 2.3 miles you could play around the outside of a lake, but the thick bushes and many fallen trees prove too obstacle-y. I was only able to stand comfortably at one place near the shore, but I’m sure with some scrambling, there are other places to relax. 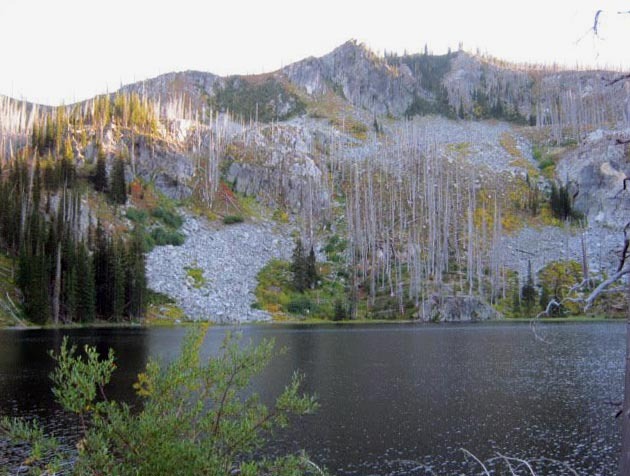 This is not the best lake hike if you like to play around the water. Instead, do it for the moderate grade, the somewhat short distance, the foliage, and the thoughts of beautiful, colorful death.